I read a personal finance book so you don’t have to! One specifically for people like me and most of my friends! What is this book, you ask? Broke Millennial: Stop Scraping By And Get Your Financial Life Together, by Erin Lowry. This book is full of tips and tricks to help twenty and thirty-somethings pay off student and consumer debts (just like a Lannister), and start saving fat stacks of cash. I really enjoyed reading Broke Millennial. Yes, it’s about personal finance (yawn), but Lowry wrote about these seemingly-scary topics in a very accessible, entertaining way. All of the chapters are laid out with a clear introduction, multiple sub-headings followed by tons of great information, and then a quick, succinct conclusion that wraps everything up nicely. If you really wanted to speed through this book, you could just read the conclusions of each chapter. Some of the topics discussed include: dealing with your debt, making and sticking to a personal budget, picking financial products (bank accounts, credit cards, investments, etc. ), student loans, talking about money with friends and partners, negotiating salaries, and buying a house. Yeah, Lowry is convinced that millennials can buy houses, and after reading Broke Millennial, I kind of believe her. Paying down student debt as a twenty-something starting their career in a precarious work environment is hard. I know. I’ve done it. But Lowry offers tons of beginners tips for saving in her book. I’m going to share two of them with you here, so even if you don’t have time to read (or, honestly, skim) Broke Millennial, you’ll still reap some of the benefits of it. 1. Make a personal budget that accounts for you spending your entire paycheck. This doesn’t mean that you’re supposed to go and spend all of your money on books and pizza. Instead, it means that after you pay all of your monthly expenses (rent, phone, utilities, food, drinking with your pals, etc. ), whatever leftover money you have should be spent on paying off debt or topping up your savings. That’s right. Go on a shopping spree where you give OSAP some extra dollars, or send your credit card company more than the minimum payment they asked for. You should budget some money for entertainment and treating yourself, but all of your extra cash should be padding your savings. 2. The money you do set aside for entertainment–whether that be ordering take out, getting drinks after work, buying a new outfit, whatever–should be taken out of your account in cash. This way, you know that each month you only have X amount of cash to spend on whatever your heart desires. Once that cash is gone, so is your freedom to celebrate with bottomless sangria. I actually tried this cash method over the weekend. I had plans to grab breakfast with a pal, and then head over to a local farmer’s market and some thrift stores. I took out a pre-set amount of cash, and told myself “THIS IS ALL YOU CAN SPEND SO DON’T LOAD UP ON CINNAMON BUNS!” I stuck to my cash budget, and didn’t fall back on my debit/credit card at all. It was a great feeling. I’ve been blessed with a Dad who is constantly harassing me about my personal finances (“ELIZABETH, save your money!! !”) and harping on the fact that I don’t really know the difference between a mutual fund and an index fund (“You went to university what did they even teach you there?!”). Now, thanks to Broke Millennial, I think I finally know what he’s been yelling about for the past couple of decades. 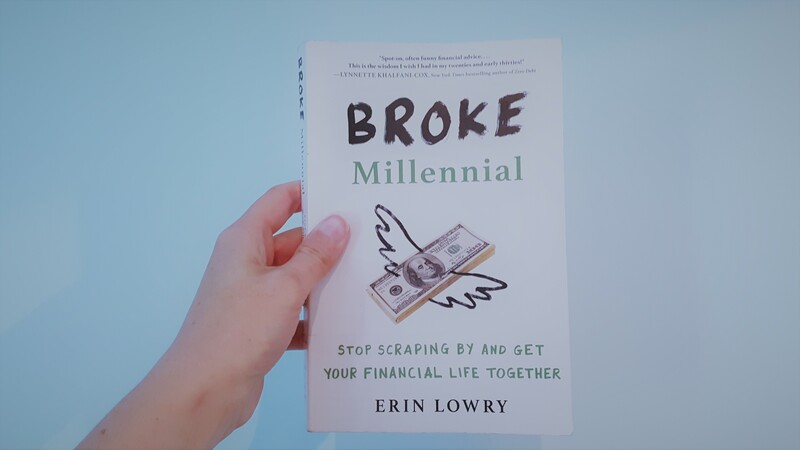 But honestly, after taking a couple of hours to read through Broke Millennial, I have a much better understanding of how to get my financial life together. Yes, writing out a plan on paper is much easier than actually executing said plan, but between my Dad’s constant nagging (I am very thankful, Dad, I promise), and some of the tips Lowry goes over, I feel a lot better about being able to one day purchase a house and fill it with avocados. It may seem simple, but there is some very good advice there, especially about credit cards. It’s incredible how much interest charges on a cc can add up. Here’s looking forward to hearing about your house full of avocados.